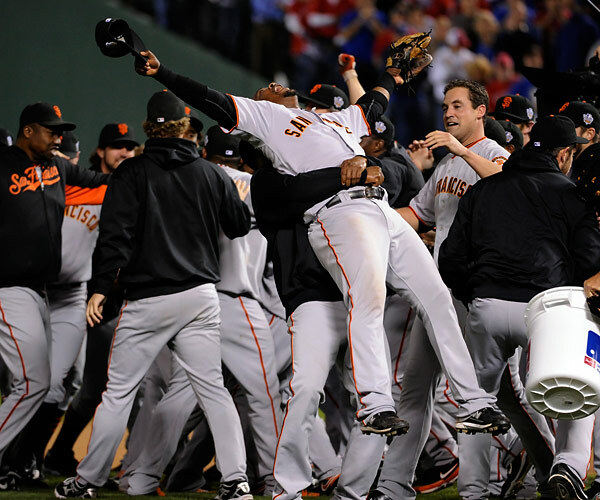 The 2010 baseball season officially came to an end Monday night as the San Francisco Giants defeated the Texas Rangers 3-1 to win Game 5 of the 2010 World Series and capture their first world championship since moving to San Francisco from New York in 1958. The story line from Game 5 was short and sweet. 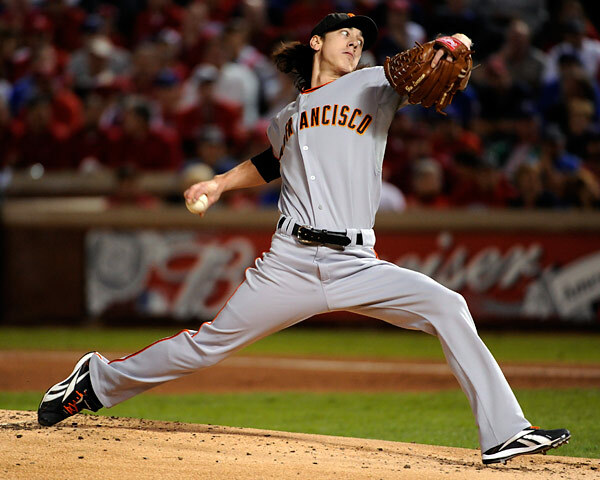 Lights out pitching by Tim Lincecum and and a three-run jack by soon-to-be crowned World Series MVP Edgar Renteria. For Game 5, it was my turn in our MLB Photos rotation to shoot from the outside third base photo well. On any other night, this is a great position to work from. However, since Game 5 was a potential clinching game for the Giants, and since the Giants took up residence in the third base dugout, I knew I would encounter trouble trying to shoot the post game on field jubilation from this location. The Giants would charge out onto the field and run toward the pitchers mound, totally blocking my view of the pitchers mound area (and giving me nothing but backsides to shoot as well). Not what I would call the ideal place for making celebration images. It would have been foolish to think that someway, somehow, I wouldn‘t be blocked and I would have a clear view of Giants closer Brian Wilson. I knew I wouldn’t see the mound, much less Wilson. Besides, Wilson would most likely first turn toward centerfield to do his trademarked crossing off his arm before turning to face Buster Posey. After processing all of the possible scenarios, my game plan became pretty simple. When Edgar Renteria hit what turned out to be the eventual World Series winning three-run home run off of Cliff Lee with two out in the seventh inning, I knew he would be chosen as the Series MVP. 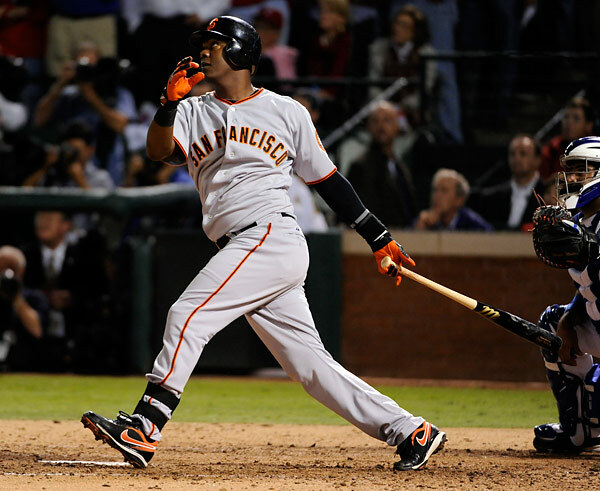 Since Renteria hit the go-ahead home run drove in three runs in Game 2, I felt this home run sealed the deal. My mind was made up and I decided to key on Renteria after the final out. Speaking of Renteria’s game winning home run, that too almost became a casualty of being too close to the Giants dugout. I was able to get off one good frame of his swing (without his arm blocking his face) before the Giants sprung to their feet and blocked my view. But luckily, an old adage commonly referred to in the photo business once again held true on this night You only need one. In retrospect, my decision on how to cover the final out ended up being a good call, even though I was partially blocked by Juan Uribe and the umpires leaving the field as the game came to an end. After initially concentrating on Renteria, I quickly turned to see what was happening at the mound and as predicted, I couldn’t even see the mound. There is nothing you can do but try to do your best and keep hunting for openings to shoot through until everyone has finally reached the pile of humanity we refer to as the celebration. I went back to what was now a group consisting of Renteria, Uribe, and Freddy Sanchez, then went back to the pile of bodies behind the mound and made one nice frame of Renteria being greeted by Pablo Sandoval and Cody Ross. After that, I lost Renteria for good and looked for what I call breakout celebrations. It was then I found an emotional Juan Uribe being lifted joyously off his feet. Everything happens so incredibly fast, I really didn’t know what I had until after I returned to the hotel. The “ten second rule”, which Major League Baseball puts into effect to allow everyone a “clean” shot at the initial celebration before the Fox and MLB Productions video crews swarm the scene worked well. We all had a clean shot, it just wasn’t the best of shots. Actually, it was pretty disappointing. I’ve seen much better celebrations over the years. It was nothing compared to the Yankees World Series celebration we had in New York last year, or when Jonathon Papelbon flew off the mound in Colorado to end the 2007 World Series. I guess we’ve all been spoiled in recent years. The end of the baseball season is bittersweet for me. I love the game, and knowing that I won’t be shooting another baseball game until sometime in late February is somewhat sad. The good news is I can catch up with family and friends over the coming months. Before you know it, the call of “play ball” will resonate in the dry Arizona air and the wonderful cycle of life called baseball will start all over again. Congratulations to the World Champion San Francisco Giants and to a few of my Bay Area friends, Giants team photographer Andy Kuno and MLB Photos teammate and die hard Giants fan Brad Mangin. The wait is over, boys. Let the party begin! This entry was posted on Tuesday, November 2nd, 2010 at 11:19 PM	and is filed under Assignments. You can follow any responses to this entry through the RSS 2.0 feed. 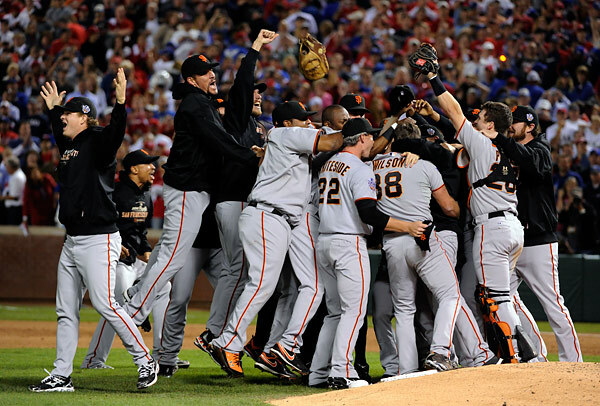 As a long time Giants fan, I am looking for the perfect picture to get the sense of history that this win is. That is, I’m looking for a photograph of the Renteria AB taken from home plate, maybe 2nd deck, with a view of the whole infield. You’d have to see Ross and Uribe. Any Giants fan knows it. This is the moment. Lee pitches 2 balls. 3rd pitches comes. 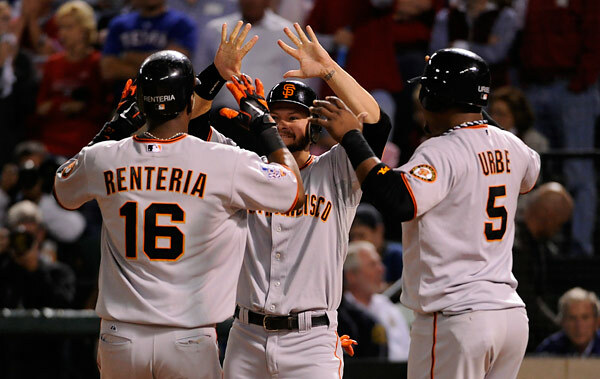 A few seconds later, the Giants are essentially world champions as far as the boxscore goes. I have been looking everywhere but I can’t find that picture. I haven’t seen it, but I’m sure someone that was shooting from an elevated position might have. We had problems with fans blocking the view from the elevated positions however, so many photographers changed positions after Game 3. Just the nature of the venue. Keep looking. If I find it, I’ll be back in touch.